Driving along Valley Ford Road in Petaluma, passersby might think they are catching a glimpse of a zoo. What some might guess is a part of a roadside attraction is actually a milking water buffalo herd and the dairy of new Sonoma County Farm Bureau member Andrew Zlot. Why would someone want to start a water buffalo dairy? Surprisingly, in the case of Double 8 Dairy, the answer is mozzarella cheese. Andrew Zlot, owner of the only water buffalo dairy in Sonoma County said he was interested in making authentic Italian style mozzarella. This gap in the market sparked his desire to start his own water buffalo dairy right here in Sonoma County. The dairy, called Double 8 Dairy because of the double 8 herringbone milking parlor has a herd of water buffalo and jerseys that are milked daily at 7 a.m. and 4 p.m.
Zlot said that he added jersey milk cows to the herd because he was interested in producing a pure jersey product. To start the buffalo dairy, Zlot bought 28 bred heifers from Texas. He said that they weren’t used to a dairy environment, so the biggest challenge was to get them accustomed to going into the milk barn and to be comfortable with milking equipment on their bodies. 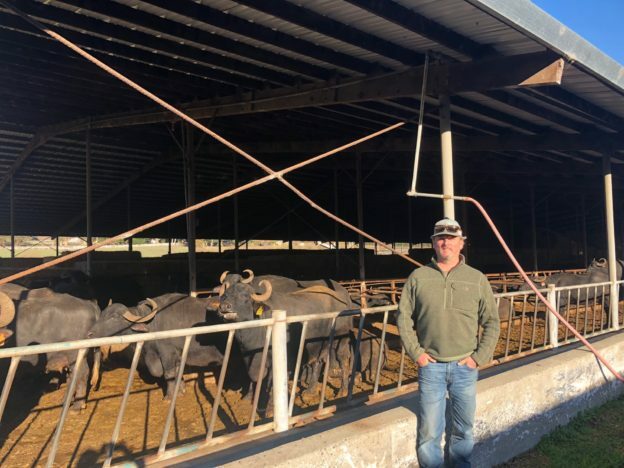 Zlot said that he knows of a couple water buffalo dairy herds in California, one in Colorado, one in New Jersey, one in Pennsylvania, however, aside from Double 8 Dairy, there aren’t any significant professional water buffalo dairies in the area. Why? Zlot explained that water buffalo, not surprisingly, are a hard animal to profit from. That is, unless they produce more milk. This is a goal Zlot said he is hoping to achieve. Double 8 Dairy is currently in a growth phase. The goal is be able to produce much more milk from a given animal. To accomplish this goal the water buffalo are bred using AI with genetics imported from Italy. Zlot said that this is because Italian water buffalo produce a lot more milk than herds in the US currently do. A common characterization is that water buffalo are very aggressive and dangerous animals. However, Zlot explained that the water buffalo in Africa are very different than the water buffalo he has at Double 8 Dairy or other water buffalo from around the world. According to National Geographic water buffalo have been domesticated for more 5,000 years. Today, there are 168,000,000 worldwide and 70% of them are milked. He said that the water buffalo’s personalities are a lot more interesting and complex than his jersey cows. Zlot said that he thought the hard part initially, was getting the milk from the animal, but he said he quickly learned that it’s much harder to actually make cheese from the milk. Jersey cattle are known for their high butter content of about 4.5-5%, however water buffalos have a significantly higher butterfat, which can range from 9-10%. Zlot said that it makes for a very smooth creamy texture in his products but it also poses challenges. So, he said that he teamed up with a family in southern Italy to learn how to make mozzarella the traditional way. Today, Double 8 Dairy’s cheese maker, Francesco Ruocco, who is also from Italy, processes cheese and gelato 6 days a week. The products are only available to wholesale customers, which are predominately restaurants clients in San Francisco, Berkeley, Southern Marin, Oakland, West Marin and Napa. 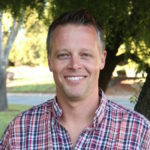 Although he didn’t come from an agriculture background Zlot said that he intends to be in this business venture for the long haul and that he became a Farm Bureau member because he wanted to be more involved in the agriculture community in Sonoma County. Just like in the traditional dairy industry, the days can be long, and they can be tough but Zlot said that he enjoys facing challenges and thinking creatively about his business and its many opportunities to grow and succeed. Zlot said that his buffalo seem to like the climate, food, and living conditions on Valley Ford Road. Now, in addition to happy cows it seems that at least here in Sonoma County, we can boast about having happy water buffalo too.